Long ago, biologists categorized life forms into two divisions: animal and vegetable. Then, they added a category for fungus, and one for microorganisms. Further study revealed that microorganisms must be divided up too. Though consisting of just a single cell, certain organisms, such as amoebae, had something in common with the cells of animals and plants. Each amoeba contains a nucleus and various other intracellular compartments, called organelles. This led to terms Eukaryote, referring to organisms with nuclei, and Prokaryote, referring to bacteria, which lack nuclei and other organelles that characterize eukaryotes. 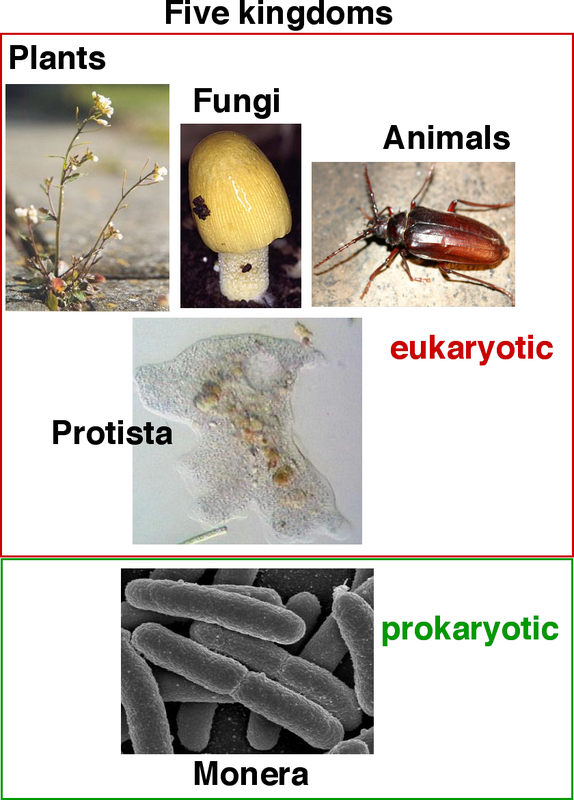 The similarities and differences between cells of eukaryotes (left) and prokaryotes (right). From Science Primer (National Center for Biotechnology Information). Until the late 1970s, the term “prokaryote” was synonymous with “bacterium,” even though prokaryotes were being discovered that differed greatly from bacteria in terms of their biochemistry and the composition of fatty acid molecules in their membranes. Scientists found that many of these less-familiar prokaryotes lived in environments that were considered extreme for both bacteria and animals. For instance, some were found to thrive in very hot environments, very cold environments, or salty environments, like the Dead Sea. By the 1970s, there were hints of a major division within prokaryotes with a group of single-celled organisms with no membrane-bound organelles that were not bacteria. Nevertheless, all prokaryotes were classified together as a single “kingdom.” When students learned high school level biology throughout the 1970s, 80s, and even into the 90s, they were presented with a kind of family tree consisting of five kingdoms branching from a common trunk. were given a single kingdom to share. But by the turn of the century biologists had decided it was completely wrong. Today, biologists estimate that there actually are hundreds of kingdoms. That’s keeping animals, plants, fungi, and protists as they were, but adding a whole bunch in the prokaryotic realm. Around 1977, Carl Woese used genetic sequences of a kind of RNA called ribosomal RNA (rRNA) to demonstrate that the evolutionary separation between bacteria and the other types of prokaryotes was as great as the separation between either group versus eukaryotes. He did this by determining the sequences of different rRNA genes — a very long, tedious process in those days — and comparing them with a wide range of different organisms. Throughout the 1980s the evidence from comparisons of genetic sequences kept growing and biologists came to accept the idea that there was a non-bacterial group of prokaryotes. They named this other group “Archaea” because the genetic comparison analysis showed that the separation from bacteria and eukaryotes took place billions of years ago; it was thus an ancient group. Some tried to rectify the situation with a six-kingdom system that gave Bacteria and Archaea each their own kingdom, but the genetic analysis also suggested huge diversity within the Bacteria and within the Archaea. Rather than undoing the traditional four eukaryotic kingdoms, the Woese discovery led to a new grouping in 1990 called the three domains. The domains were — and still are — Bacteria, Archaea, and Eukaryota. And just as Eukaryota consists of the kingdoms of animals, plants, fungi, and protists, the two other domains each are divided into kingdoms themselves. The three-domain system has changed the perspective on the place of Eukaryotes, but since 1990 the three-domain system has remained strong. Nobody is suggesting that we divert from it, but it has been changing a lot with respect to the shape and the relative lengths of the branches within each domain. What’s happened over the last few years is that, for determining evolutionary history, genetics has come to dominate over physical appearance of organisms. Back in the time of Charles Darwin, physical traits were the only available tool for distinguishing between life forms, so those were used to estimate evolutionary relationships. Humans are more like apes than they are like apple trees, and therefore the diversion in evolutionary history must have been more recent for humans versus apes than for humans versus trees. Evolutionary analysis between organisms is done by looking at the sequences of nucleotide bases (letters in a genetic alphabet) in genes and also in non-functional parts of the genome (collection of an organism’s DNA). Organisms differ in the presence or absence of specific genes and the sequences of genes that they have in common. Trees, for example, have genes to make enzymes used in photosynthesis and we don’t. And so differences in genes represent qualitative differences between different organisms. Those differences exist due to a variety of evolutionary forces, including natural selection and genetic drift, so while the genes help us to distinguish between the organisms they do not reveal the timing of evolutionary divergence between species. But then there are the non-functional areas of the genome, which are subject only to random mutation with no influence from Darwinian selective forces. Differences in these areas between two species reveal how far back in time their ancestors diverged; the greater the difference, the further back in time they shared ancestry. Modern genetic analysis confirms many of the ideas inferred since Darwin’s time regarding evolutionary history. It shows that chimpanzees are indeed our closest living relatives; our ancestors and their’s diverged sometime after about 6 million years ago. Other Eukaryotes, including apple trees, are related to us more closely than they (or we) are related to bacteria. Over the last 15 years or so, the shape of the connections has changed because of inclusion in the analysis of thousands of different microbial species that cannot even be isolated and cultured. And this means that we don’t even know their physical and chemical characteristics, so they are useful only for genetic comparison. The redesigned tree of life with three branches. © Banfield, et. al. Based on this new perspective, Jill Banfield and her team at the University of California at Berkeley published a new form of the three-domain tree of life in the journal Nature Microbiology with a distinct feature that you can see in the picture above. 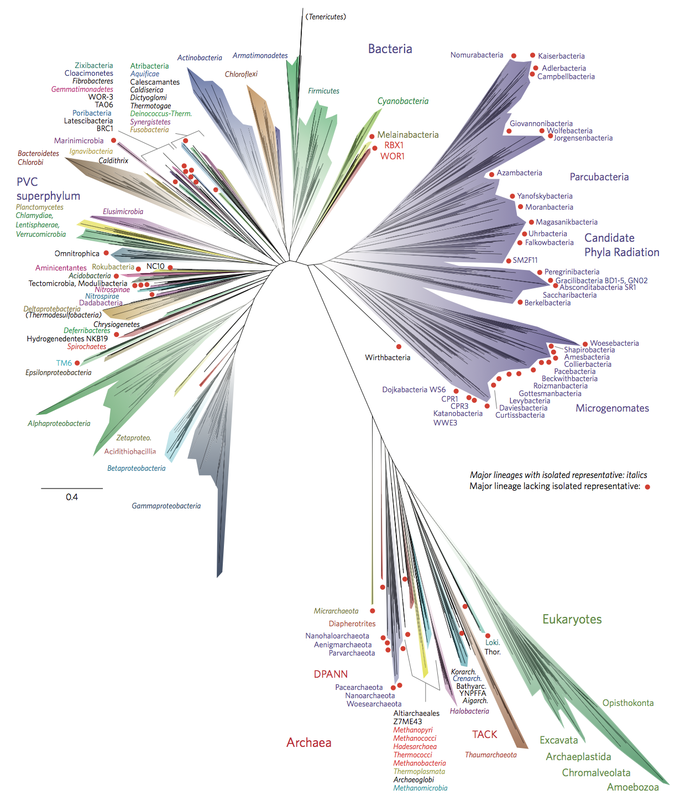 The long branch diverging from the common trunk represents a high level of sequence difference between bacteria versus Archaea and Eukaryotes. There are still three main divisions of life, but now two of those divisions are bacterial, one big and one even bigger. 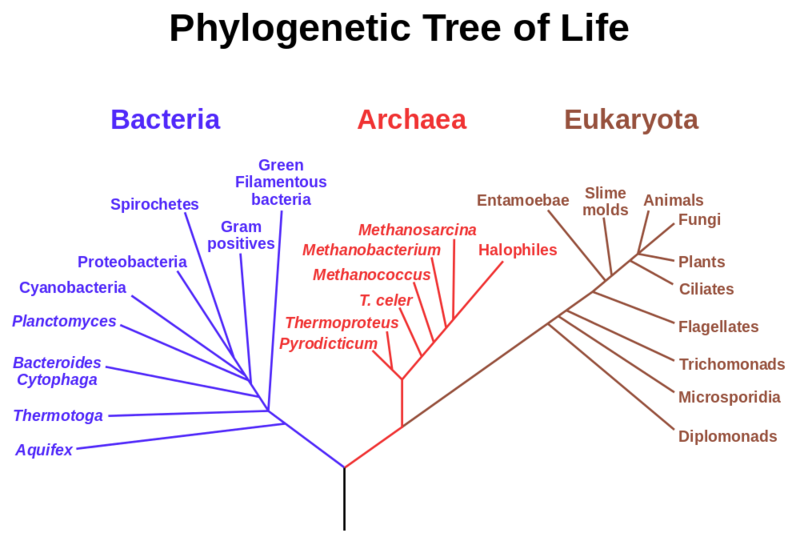 The third division consists mostly of Archaea and then a smaller group: THAT is the Eukaryotes. That’s the four kingdoms that used to dominate the classification while everything else was pushed into a fifth kingdom. If the trend based on phylogenetics continues, it also could be that one of the four Eukaryotic kingdoms –not ours, the animals, but rather the Protists which are mostly single-celled organisms, will get divided into multiple kingdoms, leaving even more of a minority status for animals, plants, and fungi, even within the Eukaryote domain. 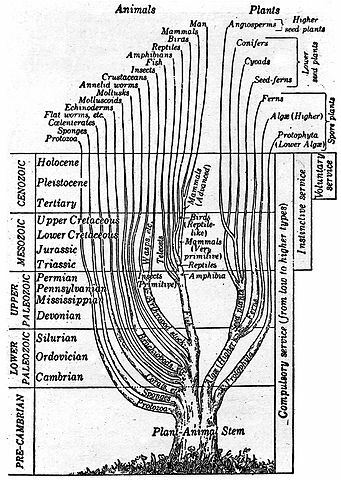 Until recently, the trend in biological classification made it seem that humans, in fact, all animals, were just a small branch on the tree of life, but it appears that we’re just a twig. David is an astrobiologist and science writer. He received his M.D. from Tel Aviv University Sackler School of Medicine, and has done post doctoral work at Brandeis University, the University of Pennsylvania, and the Johnson Space Center, where he was part of the NASA's first cohort of astrobiology training fellows. He has been involved in science outreach for more than a decade and since 2002 has collaborated with The Planetary Society on studying the effects of the space environment on small organisms.